You can sit a child with flash-cards and work-sheets and review vocabulary over and over again, but that child will not learn as fast as they would with toy blocks and a friend or parent. In such an instance, he or she would be getting the opportunity to practice math, physics and engineering, and all the while they would be stretching the muscles of their imagination. They would be solving problems, thinking out loud, listening to vocabulary and practicing their communication skills. And guess what? They would be having fun! 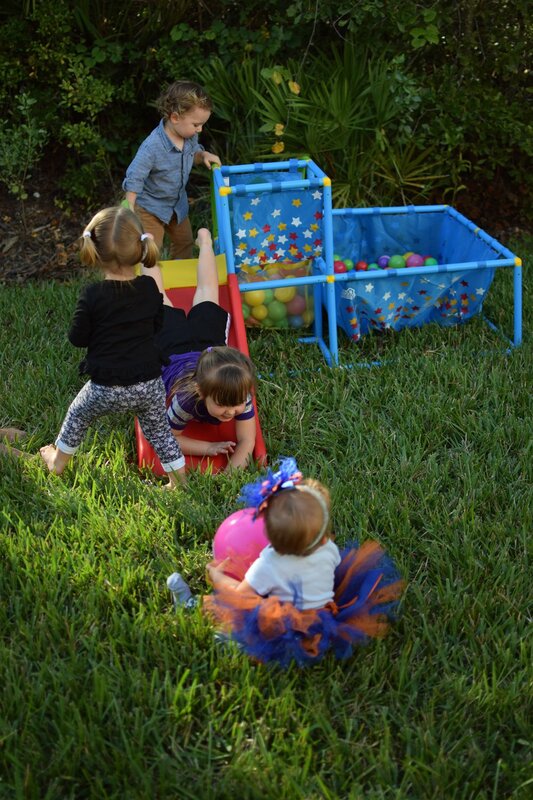 Play groups are a great way to get together with other families whose children speak your target language. Not only is it a great way for kids to practice their language skills in a fun environment, but it’s also a great way to spend time with parents who might be going through the same struggles you are. You may have to intervene at times, especially if all kids are using the same majority language instead of the target language. You will have to give them instruction and incentives to speak and probably use some forms of structured play in the beginning. You can start by introducing them in the target language and setting up some activities for them to do together. They will start associating the language with each other, and before you know it, speaking it with each other will be the default. Structured play, or goal-oriented play, comes with a set of rules and an objective in mind. Structured play is often facilitated by adults who lead and guide children as they play. Card games and board games, sports, games like Simon Says and Green Light Red Light are all examples of structured play. With structured play you can really take the reigns and do something fun that will help your child learn and practice language. Some simple games like Memory (Click here for a free printable memory game for Spanish) (Click here for the English version) Number or Word Bingo, and the above mentioned Simon Says can really help you explore your target language. In future blogs I will describe some structured play ideas that I have found to be quite effective in the classroom, but the ones I mentioned above are classics that kids love. Unstructured play, or open-ended play, is child-led. Children have the freedom to choose what they want to play with and how they want to play with it. It is open to the imagination and it can last for hours! Now, we often think that kid’s just aren’t learning during moments of unstructured play and we also think that as adults, there is no room for us in this type of play. Nothing could be further from the truth! Kids ARE learning and you ARE invited. Get down on the floor with your child and meet them exactly where they are. Babies and younger kids might be exploring the toys and trying to figure out what it is they do. They might be banging them together or simply putting them in their mouth! I know, cringe worthy moments! But I promise, it will be okay. Older kids might be playing house, veterinarians, building with blocks or Legos, making forts, or playing superheroes. Join in on the fun! This is a great time to use the target language in a natural and free way. Describe what your child is doing (parallel talk), talk about what you are doing, point out shapes, colors, feelings, ask questions (especially open-ended questions), answer questions and listen to what your child has to say. Enjoy this time with your kids and remember that this is when the majority of their learning and development is taking place. Join in when you can but remember that playing alone is also good for them. As parents we need to remember that we don’t have to be their personal entertainment 24/7. Learning and discovery is always occurring. Why are these games so addictive? Well, it's because the elements of the game (competition, point scores, rules of play, etc.) motivate us at a deep level. Even as adults we love games! Now, becoming addicted to a game is not good, especially for our children. We do not want them to spend hours and hours upon end in front of screens doing nothing else. That's not healthy! However, we can use the same game mechanics to encourage children to learn and give them exposure to language and technology that will be invaluable. At Learn Safari we incorporate the positive feelings and motivation that games provide into an interactive and intuitive learning environment. We do this specifically for language learning (starting with Spanish, and multiple languages in the future). You, as parents and teachers, can incorporate these same techniques at home or in the classroom. Bring on the game mechanics! Start with some of the classics you grew up with, but make sure you conduct the entire game in the target language. You can add rules, goals and point systems to some of the tasks you would like to accomplish and make sure you verbalize as much as you can! Talk, talk, talk... until you drop! I would love to hear from you! What does play look like in your home or classroom?